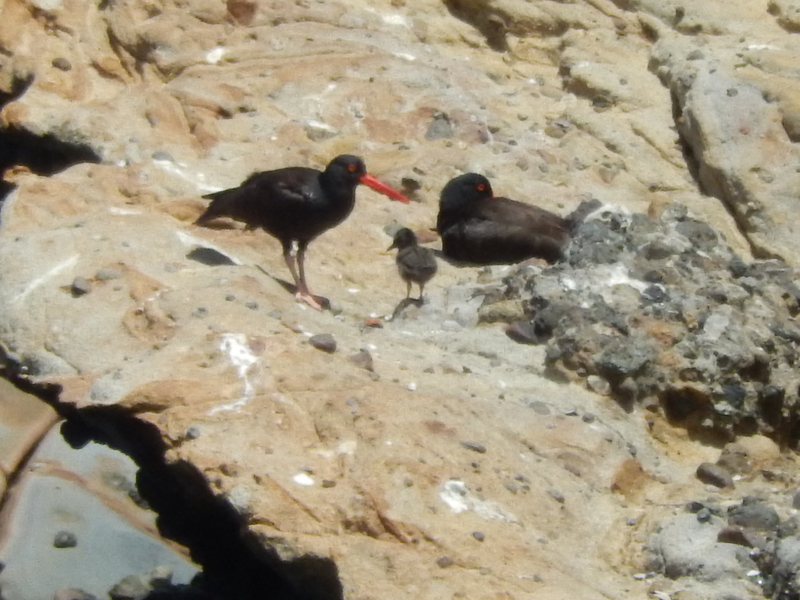 Black Oystercatcher Monitoring Volunteers to the Rescue! The Black Oystercatcher is such an interesting and unique bird that it is no surprise that several members from the community have asked to join volunteer monitoring efforts along the coast! 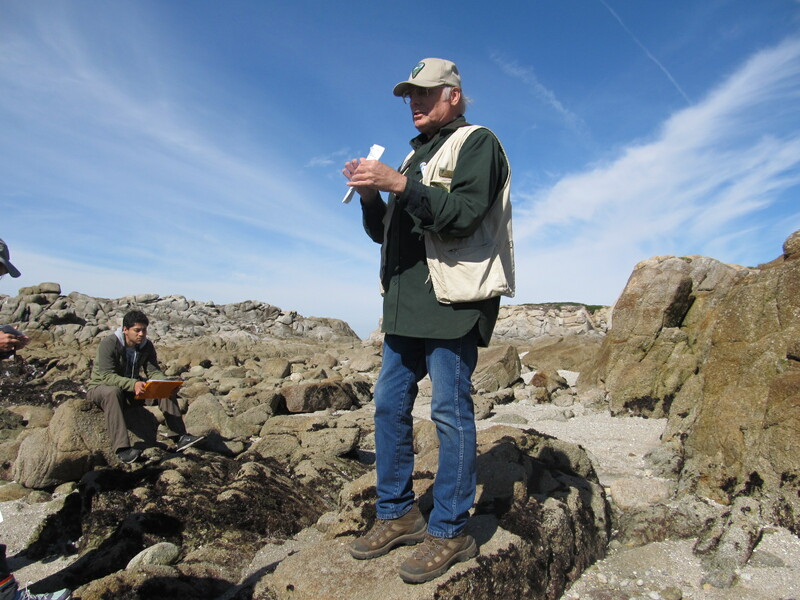 A lot of volunteers from the Pacific Grove Museum of Natural History have stepped up to the plate and are ready to volunteer in monitoring different Black Oystercatcher territories along the Monterey Peninsula. A lot of docents from Point Lobos State Reserve have also volunteered to monitor Black Oystercatchers within the Point Lobos Reserve. The assistance of these volunteers is especially crucial during breeding season because we want as much information as we can get about the Black Oystercatchers’ reproductive success. Although a lot of the volunteers are already acquainted with the Black Oystercatchers, as the birds are loud and conspicuous, they were still asked to attend an orientation with information about the birds and their behaviors. The orientation meetings were led by local Black Oystercatcher experts Rick Hanks and Hugo Ceja. In the past couple of years Rick and Hugo have gotten to know the behaviors and territories of the Black Oystercatchers very well. The meetings were very informative, and the volunteers learned about the data forms that we will be using this season. The volunteers seemed very excited to pick a territory and to start monitoring the Black Oystercatchers! Hopefully the Black Oystercatchers have a lot of success this season! Rick Hanks talking to volunteers about the data sheets we will be using this season. EFTA intern Daniel Gomez looking super focused! Back at the labs and Nest Box Monitoring! This week I was able to help at the benthic invertebrates labs at the Elkhorn Slough Reserve. It had been a while since I’d had the chance to participate in one of these labs but it’s around that time of the year when lots of schools are having field trips at the Elkhorn Slough Reserve. 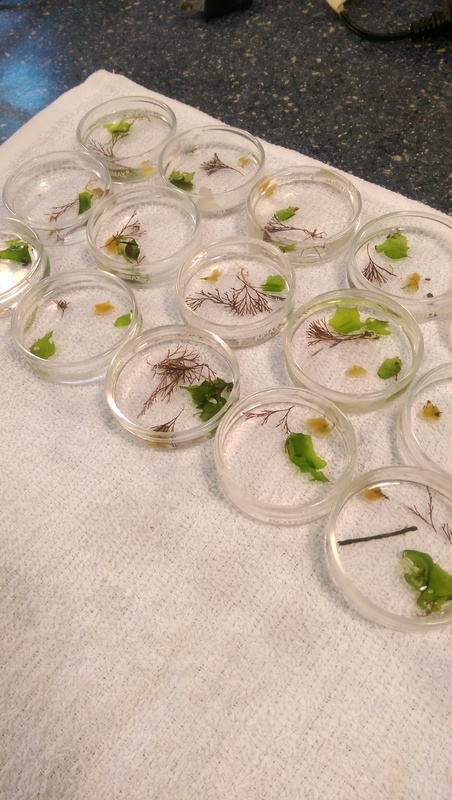 Some of our benthic invertebrate samples! The students we had this Wednesday were students from a high school in Watsonville. They were very knowledgeable and had a lot of questions about the material. They were very excited to look at the benthic invertebrates under the microscope! This Saturday I also attended a meeting at the Elkhorn Slough Reserve about nest box monitoring! The meeting was led by Susie Fork, who is a research biologist at the Elkhorn Slough Reserve. At this meeting I signed up to monitor some of the nest boxes at the reserve and I will be shadowing an experienced volunteer before I monitor on my own. The Oak Titmouse and Chestnut-backed Chickadee are the typical inhabitants of these nest boxes. They are both non-migratory birds so they are local to the area. The birds typically nest in the same boxes every year. The nest box monitoring consists of observing the birds for nesting behavior, counting the size of their clutch, and then monitoring until the nestlings fledge! I think monitoring the nest boxes will be a good experience and it will be interesting to compare their success rate to that of the Black Oystercatchers which typically have a low reproductive rate. I look forward to working on this project! 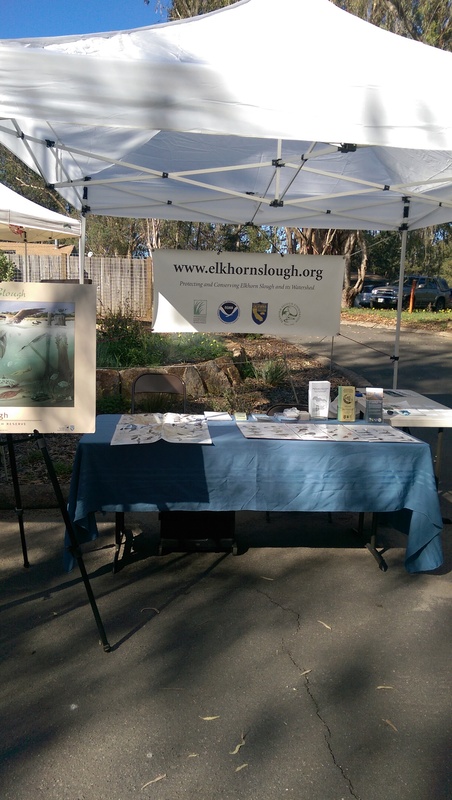 On February 14th I was able to do some outreach with the Elkhorn Slough Reserve for a Migration Festival at Natural Bridges State Park in Santa Cruz, CA. Since the theme of the festival was migration we decided to mostly focus on birds. 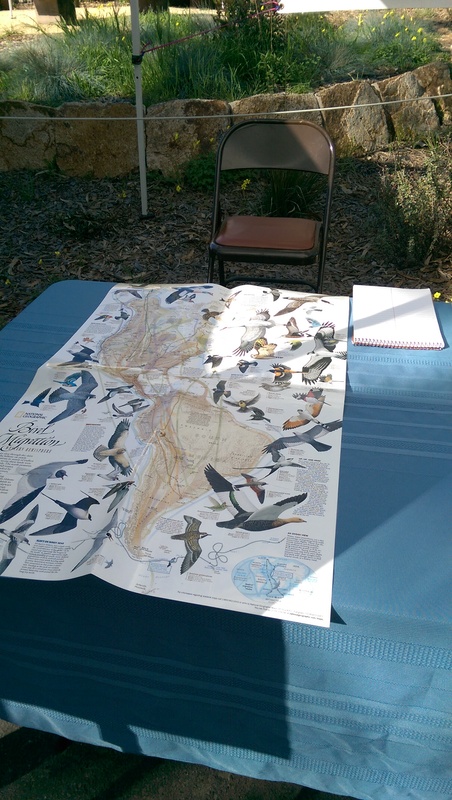 We brought along a map that showed the different migration routes and distances for several birds. Several people were interested in the map and were amazed at how far some birds travel. We also had a migration game that former intern Hugo Ceja came up with. It highlights the dangers that birds often face during their migrations such as predators, crashing into windows, or becoming stranded in places that don’t have enough food. I think this game was good because it allowed the children who played it to understand some of the realities that wild animals face and why it’s important for us to try and protect them. 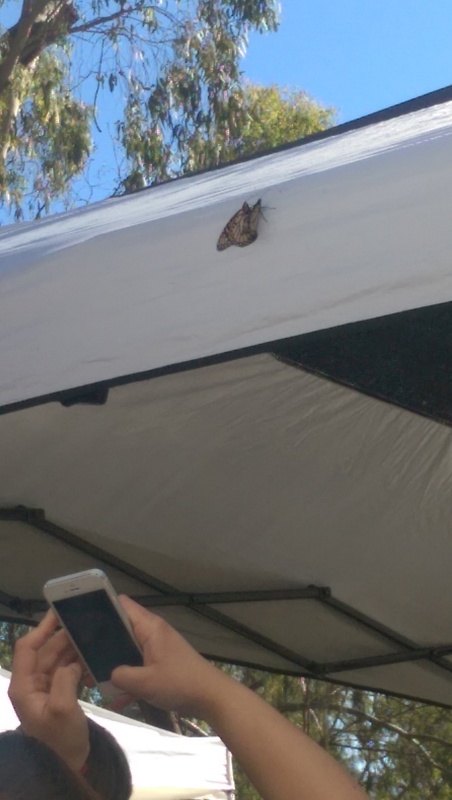 Aside from birds, there were several other organizations who were tabling for insects, especially the Monarch butterfly. Natural Bridges State Park has a large population of Monarch butterflies and there were several fluttering around on that sunny day. I believe that having the monarchs there allowed people to make a deeper connection with the importance of preserving the monarchs, especially since they are highly threatened and becoming endangered. It was a great day to do outreach because the weather was sunny and beautiful which allowed people to come outdoors and enjoy their state parks. Hopefully we will see some of the people who stopped by our table at the Elkhorn Slough Reserve! Our table at the Migration Festival! Our map showing the different migration routes of several birds. Some monarchs decided to try and breed right in front of us! A lot of my time at the Elkhorn Slough Reserve has been spent in the plankton lab that is offered to school groups as part of their field trip. It is a really neat lab because it allows students to interact with microscopes, something that some students might not have a chance to do within their regular school year curriculum. The key to a good lab is collecting a good sample from the slough. This usually requires a pair of rubber boots to get into the water and collect some big chunks of bryozoans, which are a plant-like colonial animals that the benthic invertebrates like to hang from. 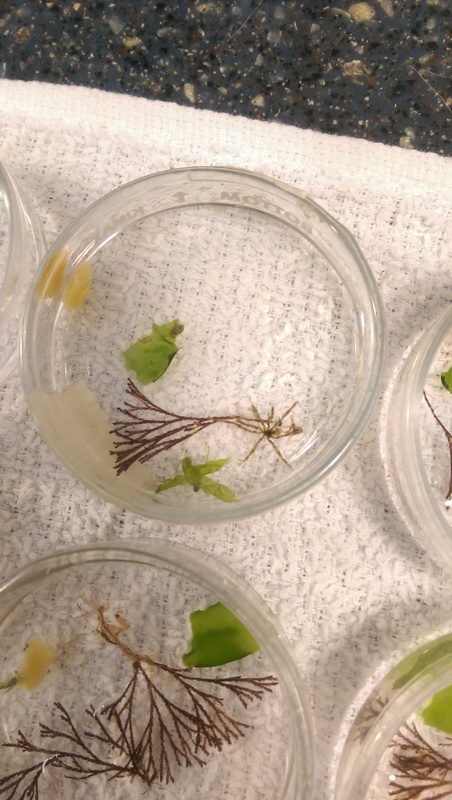 Some of the most commons benthic invertebrates we see in the lab are Caprellids, also called skeleton shrimp. When most students first see them under the microscopes they are a little spooked because of their alien-like appearance. Most people think they look like mantises of some sort. Another critter we often see are sea spiders from the class Pycnogonida. Students usually ask if they’re actual spiders and they are not, they just look like land spiders. We also get brittle stars and small sea jellies. The best part about the lab is seeing how excited the students are looking at their samples. Especially after they’ve had some initial trouble focusing the microscope but then eventually get it right and are able to see the critters clearly and sharply. Helping in the labs was always a fun activity. And it was also a reminder about how we are surrounded by micro and macroscopic life, and that sometimes it’s important to appreciate it and observe it sometimes.